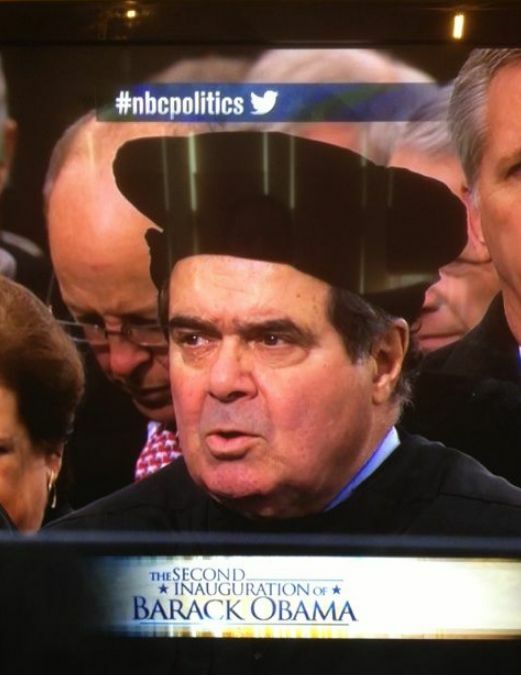 A former law clerk for Justice Antonin Scalia is clearing up the mystery surrounding the justice’s choice of inauguration headgear. Scalia wore a black-cornered skullcap deemed "a beret on steroids" by the New York Daily News and "a really weird hat" by Sen. Claire McCaskill in a tweet. The hat was a November 2010 gift from the St. Thomas More Society of Richmond, Va., says former Scalia clerk Kevin Walsh in a blog post and an ABC News interview. The skullcap is a custom-made replica of a hat shown in a famous painting of the beheaded English chancellor, according to Walsh, a University of Richmond law professor. Josh Blackman’s Blog has comparison photos. Justice Stephen G. Breyer wore a "less conspicuous version" of the hat, the Washington Post’s Reliable Source blog says. The Breyer hat does not have earflaps. According to The BLT: The Blog of Legal Times, Supreme Court justices have occasionally sported skull caps at inaugurations and other public events since the early 20th century. At President Kennedy’s 1961 inauguration, seven of the nine justices wore skullcaps.